We apologize for any inconvenience this may cause. Please visit our Tutorials page for a complete listing of all the research help we offer! Got three minutes? 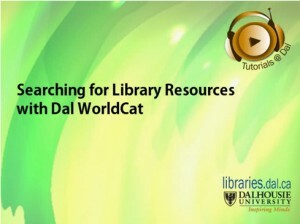 Watch this video on how to find library materials with WorldCat, our online catalogue. WorldCat will link you to the Dalhousie Libraries’ catalogue, the Novanet catalogue, and also to libraries from around the world. It indexes books, articles, scholarly journals, videos, music and more! We have lots more useful tutorials online, take a look! Learn how to find scholarly information in an ESBCO database. This tutorial shows you how to do a simple keyword search and how to build advanced searches, too. The Libraries’ online tutorials helped a lot of people last term! Between November 1st and December 31st, we clocked over 2000 pageviews of 81 of our tutorials (view the full list on our Libcasts page). Interestingly, the progression of the research cycle from researching and brainstorming in November to writing and proofing at the end of the term is seen in the type of online tutorials used in these periods. Whereas November’s most popular tutorials were mostly instructional guides for databases, December’s most popular tutorials included a blend of these database-specific lessons as well as screencasts on the mechanics of writing, e.g., The Anatomy of an APA Citation and Writing a Research Paper, Part One. This tutorial shows you how to do a basic search with the CSA (Cambridge Scientific Abstracts) database interface, and how to read your results. The libraries have many major databases that use this platform, including Sociological Abstracts, MLA International Bibliography, and PAIS International. Check our tutorials webpage for more helpful videos!